This year we are attending the UK Games Expo from Thursday afternoon until Sunday evening and we couldn't be more excited to finally get our chance to attend the whole show for the first time! The UK Games Expo takes place at the NEC in Birmingham from 1st June to 3rd June 2018. Last year, attendance surpassed that of the Origins game fair in the USA, and I can only imagine how much busier it might get this year. Thankfully there is additional space for both exhibitors and open gaming which should allow the convention to grow. With over 350 exhibitors, there will be a lot to see, so here are the games and exhibitors we'll be looking out for specifically. Board & Dice brought a great crop of exciting new releases to UK Games Expo 2017, and this year is a similar story. Here are the two titles we're most excited to pick up or demo. Escape Tales: The Awakening joins a whole host of games on the 'Escape Room in a Box' band wagon, but I have to admit that it certainly sounds intriguing, since it's a lot more story driven than the likes of Unlock and EXIT. Similar to another game I'll mention later, it has the unusual theme or trying to wake someone up from a coma. 5 Minute Chase is premiering at the UK Games Expo and sounds like a really interesting real-time game. It's a team game where the runners are trying to reach a hideout, while the chasers try to catch them. We love real-time cooperative games, but sometimes find real-time competitive games a bit lacking. Nevertheless, we want to take a look at 5 Minute Chase. Portal Games will be demoing their upcoming title Detective: A Modern Crime Board Game, which has me very intrigued. We'd also like to pick up a copy of the expansion to Alien Artifacts, which we really enjoyed. Detective: A Modern Crime Board Game sounds like a super ambitious game. It's a cooperative crime solving game that also incorporates the resources of the internet into solving the puzzles. I'm hoping for an experience more like Chronicles of Crime rather than the very dry experience of Sherlock Holmes Consulting Detective and I'm also hoping that there's some good cooperative gameplay as well as the pure detective research. As the UK's largest board game distributor, I expect that Asmodee UK will have a huge collection of new games on show, including demos and previews of some major upcoming titles. However, I'm most excited for the probably the biggest true release of the UK Games Expo - Century: Eastern Wonders, plus reviews of Coimbra and Reef from Plan B Games and Eggertspiele. Century:Eastern Wonders is a sequel to Century: Spice Road and will the second in a series of three games from Plan B Games. Century: Spice Road was a very clean card game that is now setting sail with the Eastern Wonders Game which will be more of a gamers style game, with a few more rules added to the engine building. I'm looking forward to trying it and also combining it with the original game. Lucky Duck Games have made a huge mark with their recent game, Vikings Gone Wild and there wildly successful campaign for Chronicles of Crime. If you try nothing else at the expo, I reccommend you try Chronicles of Crime, as it's such an innovative game that is more than just a VR gimmick. Jetpack Joyride is another upcoming game from Lucky Duck that we're really excited to see. It's a competitive real time puzzle game where you compete to build tracks across your laboratory using pieces that look like they came from the game Blokus. We don't know a lot about the game, but Lucky Duck have our attention! White Wizard Games will be demoing at the Gamesquest stand. They will be showing Hero Realms, Epic Card Game Pantheon, Star Realms Frontiers and their upcoming game Sorcerer. Star Realms Frontiers was a Kickstarter project that works as a standalone game. We have been happy with our base set of Star Realms for a long time - it's a great, small deckbuilding game and even Hero Realms has't dethroned it for us. I'm not sure how much new and exciting content there will be in Star Realms Frontiers, but I'm intrigued to find out. 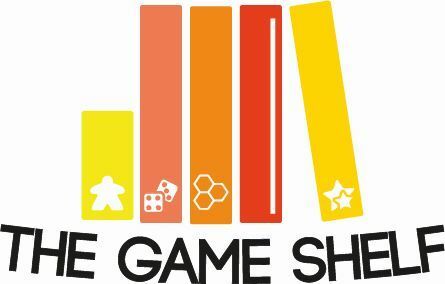 Alley Cat Games are showing demos of a lot of new games at the UK Games Expo, and are showing that they'll really be expanding their catalogue following the success of their Kickstarter for Dice Hospital. I'm excited to check out quite a number of their games, but here are a couple of highlights. Coral Islands is two games in one (sometimes something that makes me a little suspect), but only one of the games will be shown at UKGE. What attracts me to coral island is that the dice structure remind me of the game Blueprints. It looks like a cool 3-D puzzle that might suit us really well. Dice Hospital is a game that we almost backed on Kickstarter, but we only back one game a month and Kickstarter can be a competitive place! Hospitals are a great under-used theme and the feedback from early playtests of this game appear to be really positive. Hopefully we can try for ourselves. Brain Games had huge success with Ice Cool, their penguin flicking game that won the Kinderspiel Des Jahres last year. We are also big fans of one of their smaller games, which we got at the Expo last year, called King Frog. This year we're excited to check out a couple of games in particular. Ice Cool 2 is a standalone game, as well as an expansion that can be played with the original Ice Cool. It sounds that it will add some cool extras to allow more tactics and player interaction in the game, as well as bring new layouts and the ability to play with 8 players. It will only be for demo and preorder at UKGE. Pikoko is a trick-taking game that has 3-dimensional peacock components. Really that's why I'm interested since we are still quite new to trick-taking games and are exploring the genre. It will also be interesting to see how light the game is, since most games from Brain Games are aimed at a younger audience. Hub Games (previosuly known as Creativity Hub) are mainly known for their hit with Rory's Story Cubes and their follow-up with Untold :Adventures Await, that used the cubes in a RPG type experience. Their upcoming game appears to be a departure into games for grown-ups and it looks so interesting! Holding On: The Troubled Life of Billy Kerr has a very serious theme. Given days to live, Billy is left clinging to life by three memories that must be uncovered by the group before he passes away. The theme and the evolving nature of the game are enough for me to want to check this game out. Add to that cooperative worker placement mechanisms, which I don't believe I've seen before and this is very high on the list of games that we must check out. HABA Games always run the kids zone at UKGE, but they also make great games that grown-ups can enjoy too, so we'll certainly be looking to see if they have any giant games we can play! I'm also interested to see some of their family games, such as Karuba the Card Game. Iguazu is one of HABA's latest family titles. Iguazu is a really colourful game, with a cool waterfall board, that looks a little complex to set up! Again, I know little about the gameplay, but it looks quite light with some economic elements. Art, and a good track record wit HABA's family games is enough to draw me in to this one though. Sinister Fish games have probably had most success and become well known for their Gloomhaven removable sticker set. However they are now working on their second game, after Kickstarter success with their first game, Great Scott. Villagers is a drafting and engine building game that is currently live on Kickstarter. We have had the chance to play a preview copy and are really excited about this one. It has charming artwork and simple but interesting mechanisms which definitely make it a stand-out game. Coiledspring Games represent a number of big publishers, most notably Iello, Blue Orange Games, North Star Games and Gamewright. This means there's a lot to look forward to when checking out their stall. I'm hoping we'll see the upcoming Kingdomino expansion, but all the evidence makes me think it won't be there. Nevertheless, here's a couple of games I'm looking forward to checking out. Raids is exciting because it is getting its premiere at UK Games Expo. It's a little disappointing that for such a large convention we still don't get many 'firsts', so Raids, from Iello, is definitely on our list. There's not a lot of information, but it looks a bit like a cross between Jamaica and a pick up and deliver game. The board looks really nice at least and I'm looking foward to finding out more! Fairy Tile is a family weight game that reminds me a little of Takenoko - one of our favourites. In the game you're trying to fulfil objectives by having different miniatures meet on the board or to have them have line of sight by simple movement around the board. It looks light, but charming and I hope it has enough interest for us. I'm hoping that we might be able to try Dead Man's Dubloons or the upcming Spirits of the Forest at the Thundergryph Games stand. But we also expect they'll be showing their upcoming Kickstarter. Tang Garden is coming to Kickstarter next month and looks really eyecatching. We've back two Kickstarters from Thundergryph games so far, so we'll be keeping an eye out for Tang Garden. It sounds like an interesting tile laying game, so we hope to be able to play a prototype to see whether it's one to back. There are many more new games being shown - you can check out the Geeklist from Slickerdrips on BoardGameGeek or the Tabletop Together Tool. Plus, I'm sure there's much more to see that we don't currently know about - there isn't a lot of exhibitor information available. It'll just be even more exciting to find out what's on offer! As always, we're also super excited for the Bring and Buy, as well as just getting the opportunity to play lots of games, meet lots of people (hopefully - do say 'Hi!) and go to a few events and hopefully some live podcasts. My goal this year it to play more and buy less...let's see how that goes!